Thanks Fred for the 3D-view of the capstan. Much better than a photograph. 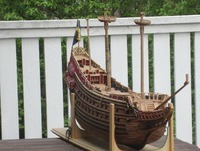 Are you on your way to display the whole ship in 3D? 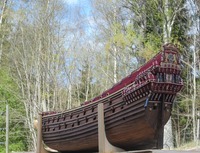 In that case, I can't wait for VASA III. Looks like you're using Rhinoceros for this. Am I right? Anyway, keep the good stuff coming. Uups! Thats wrong at my model, too. 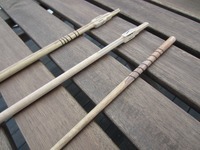 So I have to make the capstan for a third time. 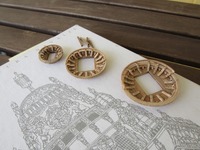 The spiral carving is also a new information for me. Must be tricky to do it well. Thanks, Fred. I assume, the capstan at the upper deck looks like the drawing of the capstan of the upper gundeck? Oh, darn... Well I can live with it as I have other errors also. 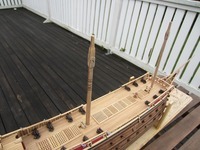 We assume that the upper deck capstan looks more or less like the one from the upper gundeck. The mounts are the same size and the pawls engage at the same place, although the upper deck mount looks slightly different - see images below. 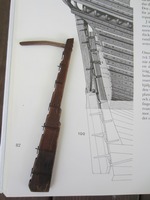 The upper deck capstan mount has a hanging step like the one for the upper gundeck, the lower gundeck mount, for a much bigger capstan, has the step notched over the beams of the orlop. Yes, Jules, we use Rhinoceros for modelling, since it can also be used as the front end for all of the digital capture technology we are using for recording, and the interface is pretty straightforward. 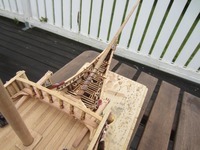 We probabaly will model the whole ship eventually, although it is laborious. For the moment, we primarily use it to model complex structures like the capstan mounts and the tops so that we can show exploded or partial versions, in order to make the construction clear to non.technical readers. 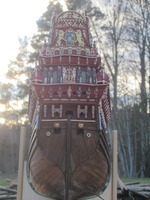 There are about 20 of these reconstructions coming in Vasa II. Thanks for sharing Fred. Love this kind of stuff. 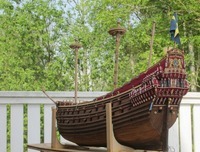 Good to hear these kind of pictures will be included in VASA II. Hey all, been working on the gunports lately. I wanted the look with some half opened and some closed. That ment cannons inside and that I would have to plank the backsides of the BB hatches as they are hollow. The hatches that are closed are scratched. 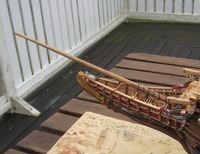 the rudder with its fittings looks very authentic! Do you apply the rudder pendants as well? Thanks Alexander! Do you mean the ropes for precaution if the stick broke? If so they they are there. Yes, now I've seen them! Cheers Clayton! Alexander they're hard to spot as they are close in tone to the hull. Hey everyone. 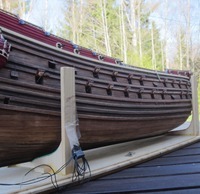 I've started the mast and rigging stage, it feels a little to start all over again as I dont know anything about it. Watch your fingers Matti,you only have ten of them. Yeah, it has been many years since I cut myself, so I need to remind myself not to get relaxed. 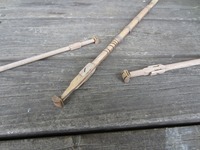 I carved a maic wand to my sons the other day and doing it in a big scale is way more dangerous in my opinion. This scale are made with such small cuts and therefore not so dangerous.